OFCC World Mints > Canada > Vancouver Mint Store. This section of Obscure Finds Numismatic Collection is about a Mint (an industrial facility which manufactures coins for currency) from the Canada region referred to as the Vancouver Mint Store. 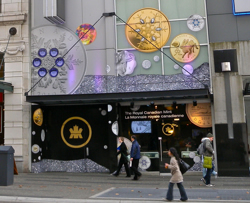 The Royal Canadian Mint's retail store location in downtown Vancouver. December 24 – 10 a.m. to 5 p.m.
December 26 – noon to 6 p.m.
December 31 – 10 a.m. to 5 p.m.